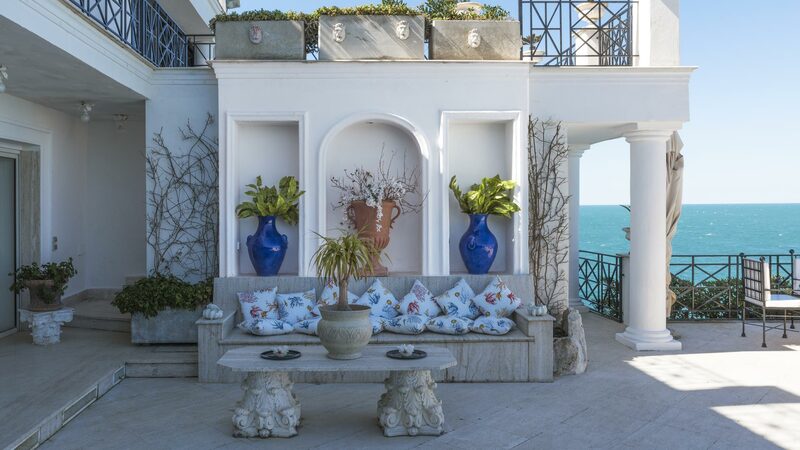 Villa La Scogliera nests in the cliffs on the promontory called “Punta Caruso” in a unique position among copses of Mediterranean scrub, large panoramic terraces and rocks that have been carefully worked to allow easy access to the crystal-clear sea. 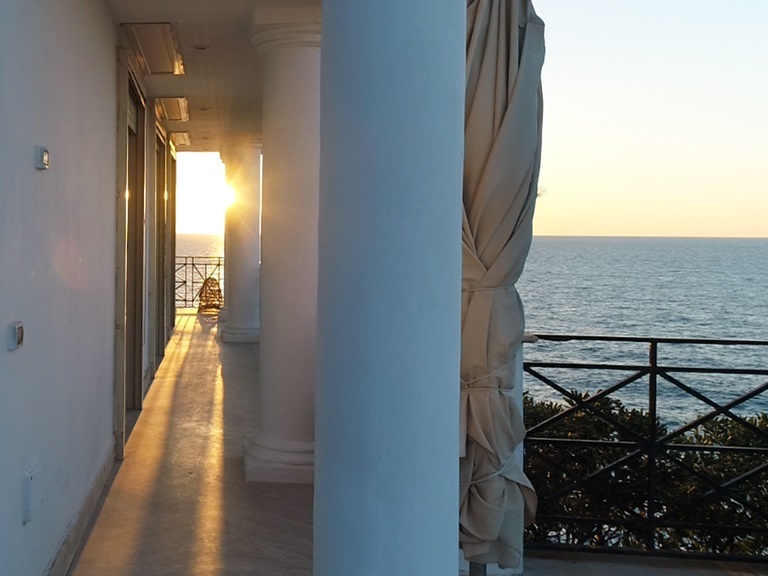 The villa has been enclosed on all sides and access to the property is via an automatic gate that leads into the parking area, and from there you go down a short flight of steps to reach the property which looks entirely towards the sea. 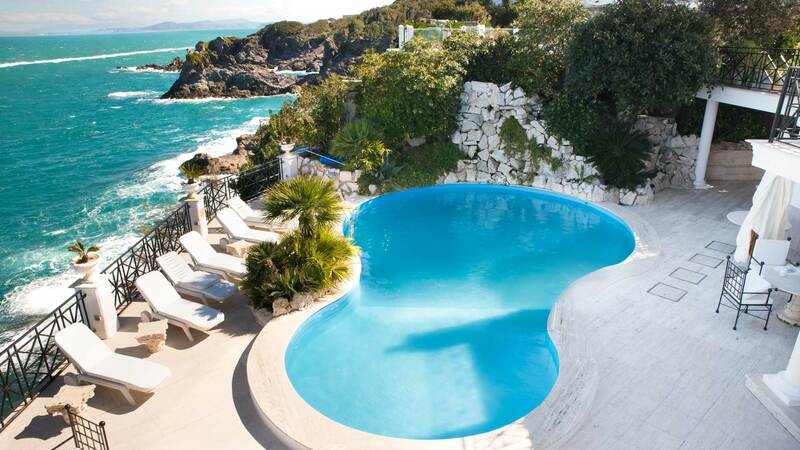 Villa La Scogliera is a splendid two-story villa located on a hillside, facing the sea. The property is tended by two caretakers, who reside in an annex on the premises. 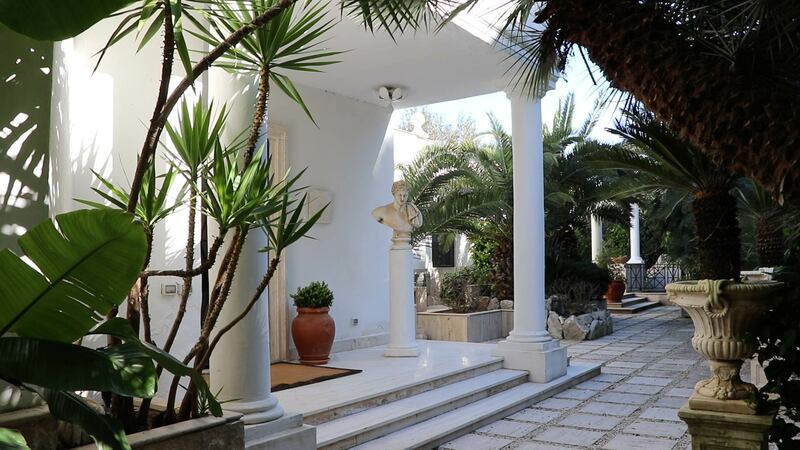 Villa La Scogliera is 600 sq. m., 2 different and charming separate Annexes. It features a private swimming pool, spacious private terraces with a view of the sea, a private garden, winter heating, WI-FI Internet access. 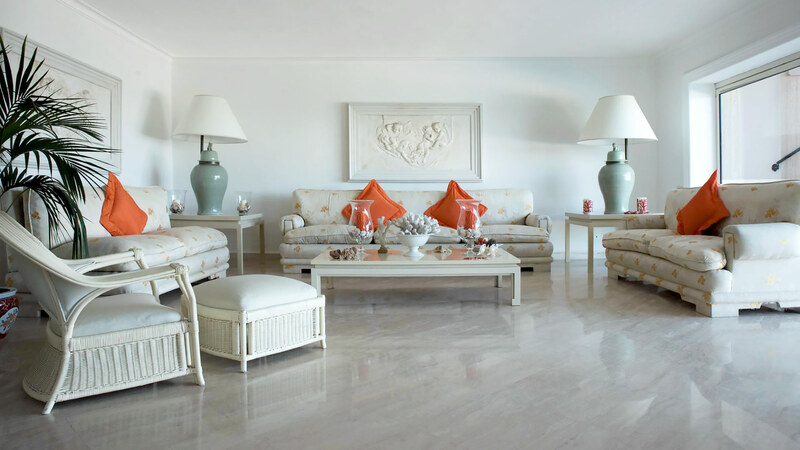 You will be roughly 3.5 km (1.5 miles) from Forio d ‘Ischia, where you will find restaurants, shops and the tourist port. 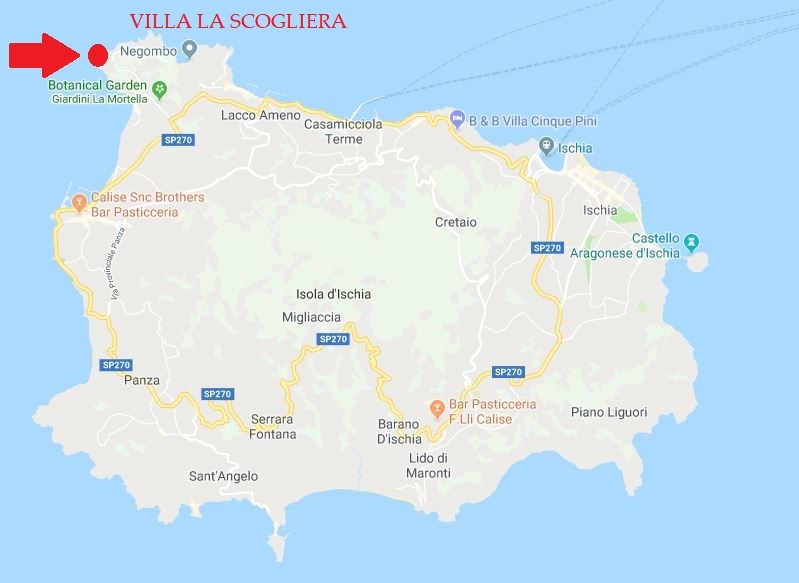 *Villa La Scogliera can be rented either with 4 (minimum 8 people) or with 7 rooms (max capacity 14 guests) prices and surface area change according to the number of people, additional and variable costs apply — please enquire with our staff. Ischia is the largest island in the bay of Naples and is considered by many to be the most beautiful, (though Capri is considerably more famous). The island is 10 km from east to west and 7 km north to south. 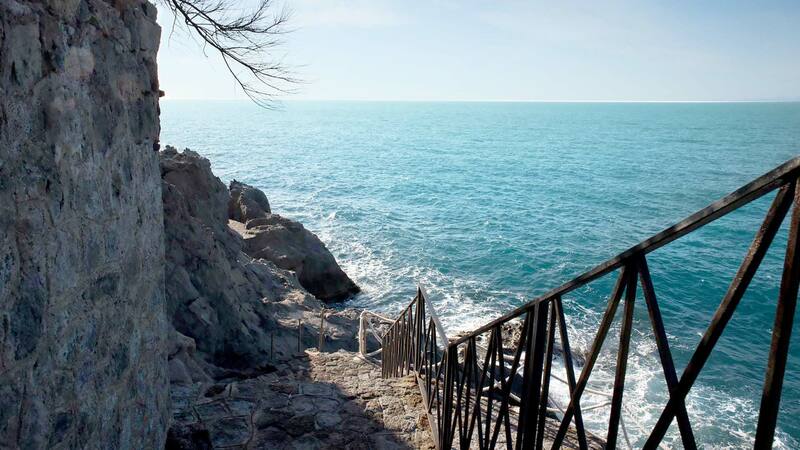 It has a coastline of 34 km and covers an area of 46.3 sq. km. It has a permanent population of approximately 58,000. Up to 6 million tourists (principally from the Italian mainland and Germany) flock to the island for its volcanic thermal spas and as well for its beaches and food. 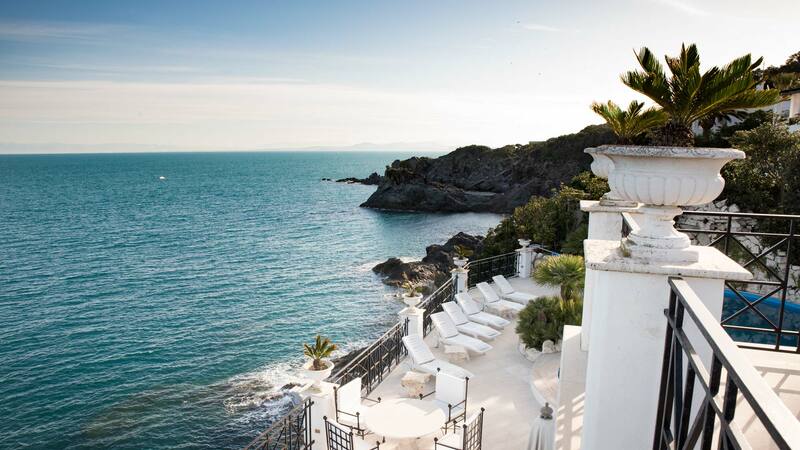 Ischia is Capri’s bigger sister, and a complete contrast. 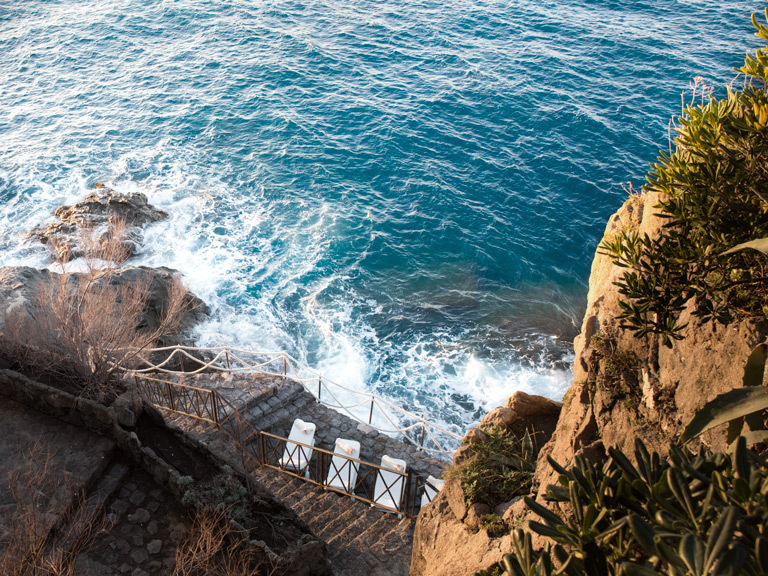 While Capri is a limestone rock, Ischia is a volcanic island, that left it rich in thermal aquifers. 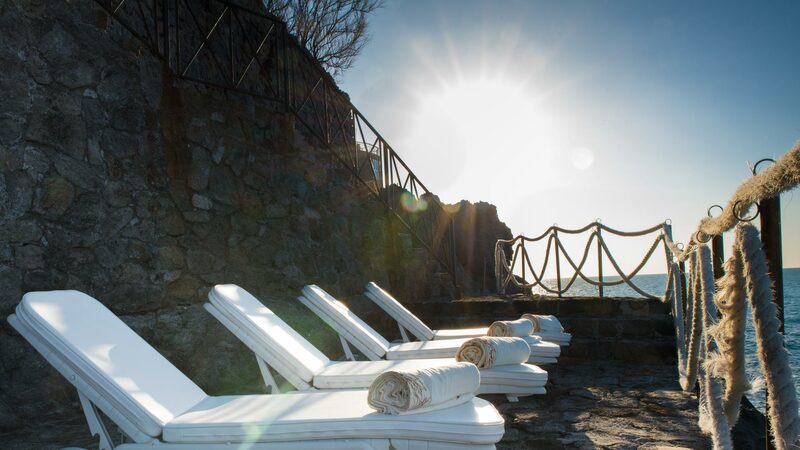 That makes Ischia one of Italy’s best-known spa resorts, where people from around the world come to soak in the curative mineral-rich waters, enjoy mud treatments, facials, massages and other health-boosting therapies. Several towns are located along the island’s coast. The largest city in Ischia is actually (and often confusingly, for tourists) called Ischia. The town of Ischia, however, has two different centers: Ischia Porto and Ischia Ponte. Ischia Porto is the commercial center of the island and is named after the main port. Ischia Ponte (“Ponte” meaning “bridge” in Italian) is named for the area surrounding and including the footbridge that was constructed to connect the Castello Aragonese with the island. 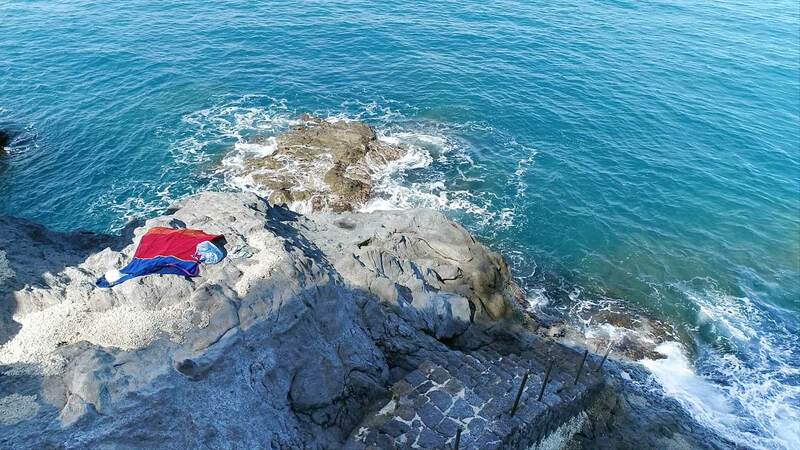 Beside the town of Ischia, some of the other centres are Lacco Ameno, Casamicciola, Forio, Barano, Sant’Angelo, and the jointed town of Serrara-Fontana. 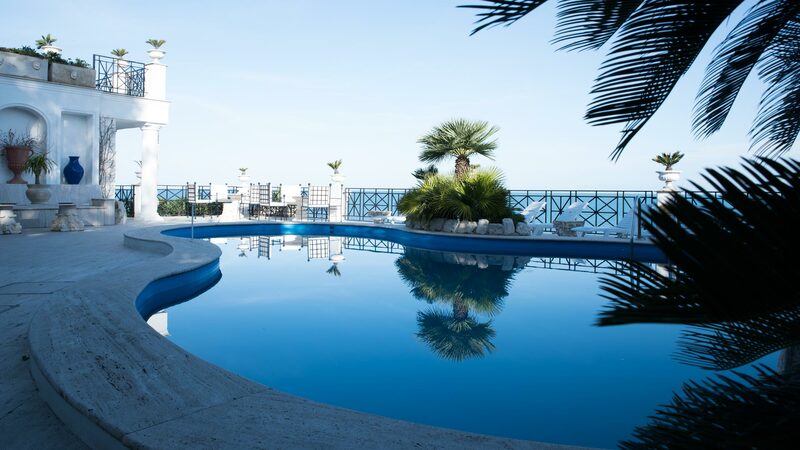 For spa seekers, head over towards Forio and the thermal parks where you can spend the day trying out the different pools and hot tubs in a garden setting. 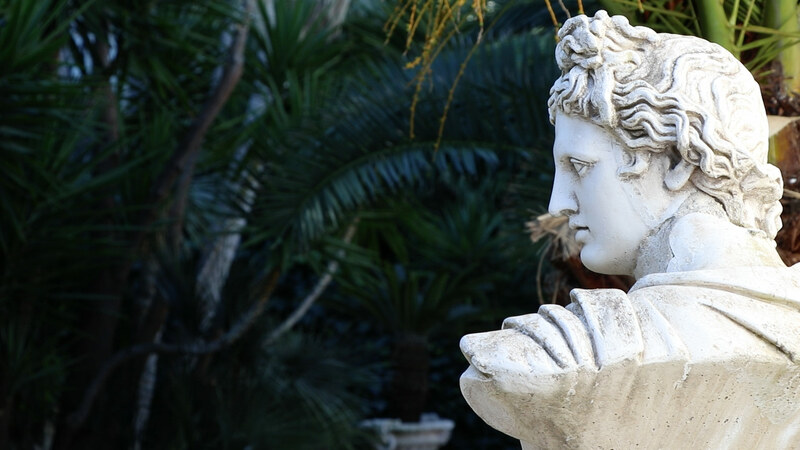 The villa lies about 20 minutes by car from the port of Ischia, and from there Naples can be reached in about an hour by ferry with your car on board and in about 40 minutes by hydrofoil. Living-room with snooker table, Air conditioning, fireplace (for decorative purposes only) and TV with access to the Main Panoramic Terrace. Bedroom 1: King size bed 180×200 cm, TV, Air conditioning, En-suite bathroom hydro-massage bathtub, Large dresser, access to a private terrace. 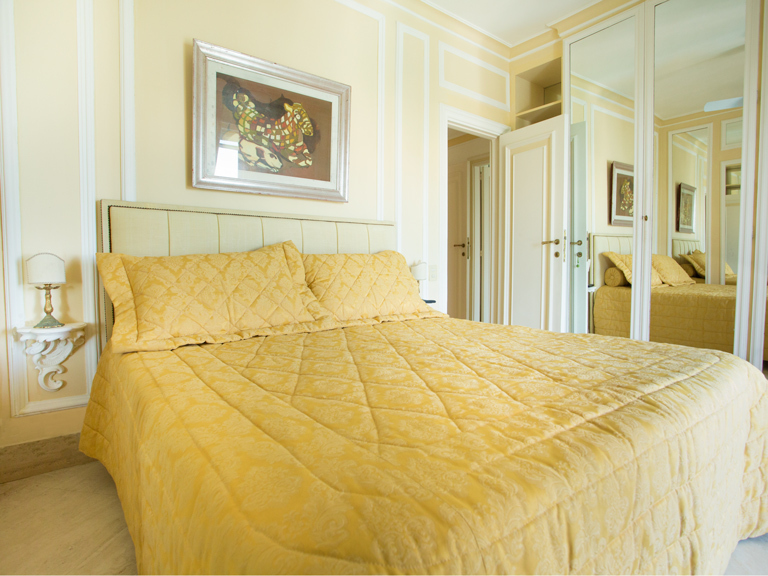 Bedroom 2: King size bed 170×200 cm, Air conditioning, En-suite bathroom with shower, Large dresser. Access from the back of the villa /garden. Bedroom 4: King size bed 180×200 cm., Air conditioning, En-suite bathroom hydro-massage bathtub, Large dresser, access to the main terrace. Bedroom 5: King size bed 180×200 cm., TV, Air conditioning, shared bathroom hydro-massage bathtub, Large dresser, access to the main terrace. 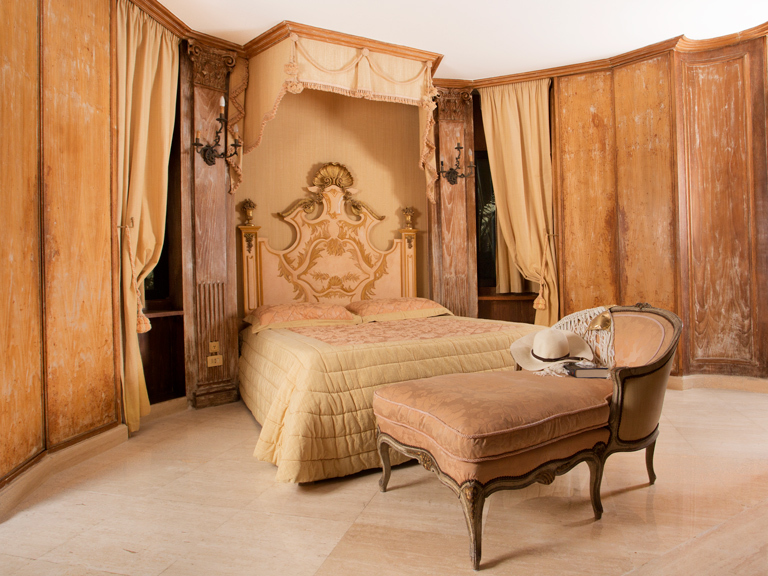 Bedroom 6: King size bed 180×200 cm., Air conditioning, En-suite bathroom with shower, access to the main terrace. Living-room with dining area, with access to the second terrace and pool area. Kitchen (equipped with a ten-burner gas cooker, electric oven, a refrigerator with freezer, a dishwasher, a microwave oven and an Italian and American-style coffee-maker). 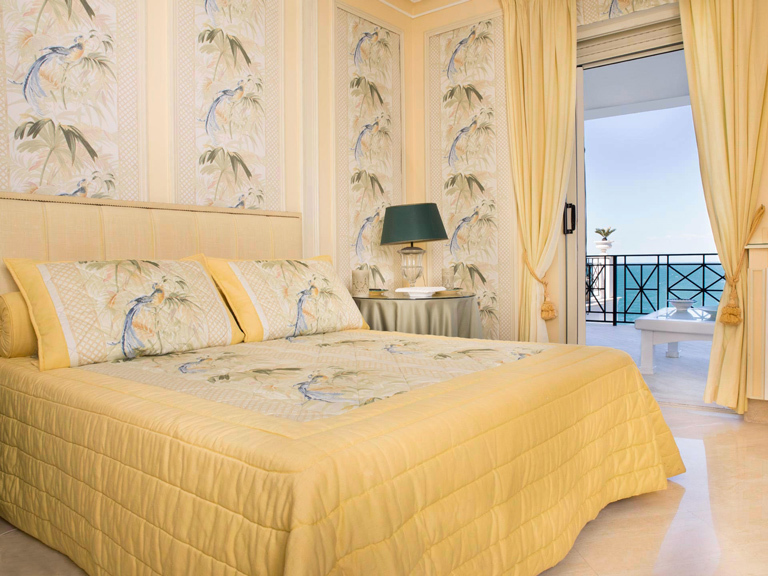 Bedroom 7: King size bed 180×200 cm., with En-suite bathroom whirlpool bathtub, TV, Air conditioning, sea view, access to the second pool terrace. 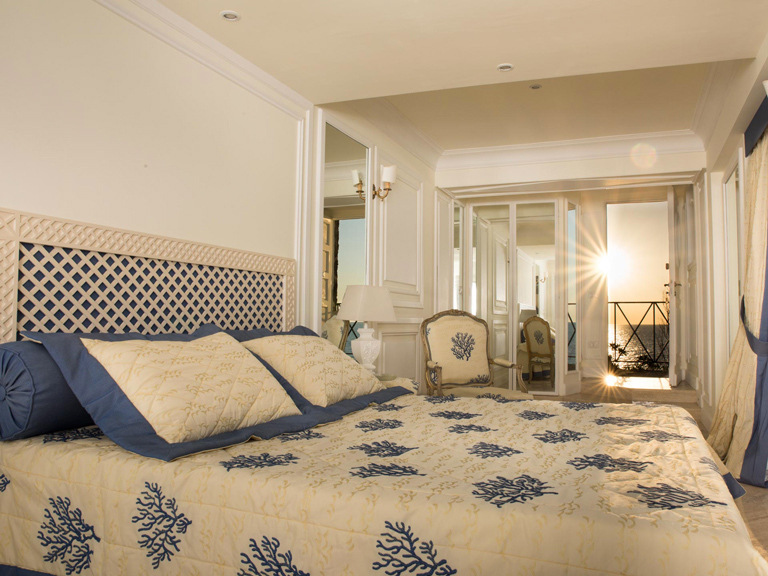 Bedroom 8: King size bed 180×200 cm., Air conditioning, En-suite bathroom with shower, Juliet balcony, sea view. Dependence n. 8 (built in the rocks) available only on request, in advance and if confirmed by the owner. House cleaner service included: this service is reserved to bedrooms, bathrooms ad living room only. 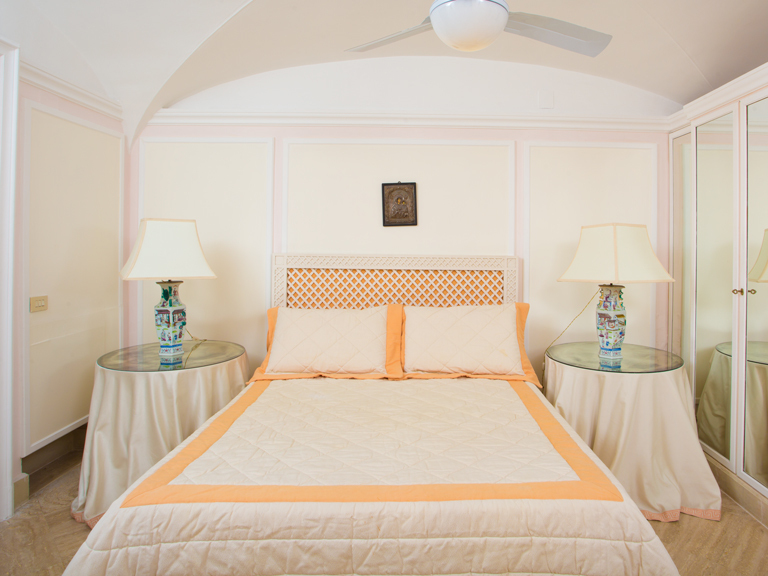 All (7) bedrooms have mosquito screens and air conditioning is available in all the rooms. The large kitchen is equipped with all the usual conveniences: with a ten-burner gas cooker, electric oven, a refrigerator with freezer, a dishwasher, a microwave oven and an Italian and American-style coffee-maker. 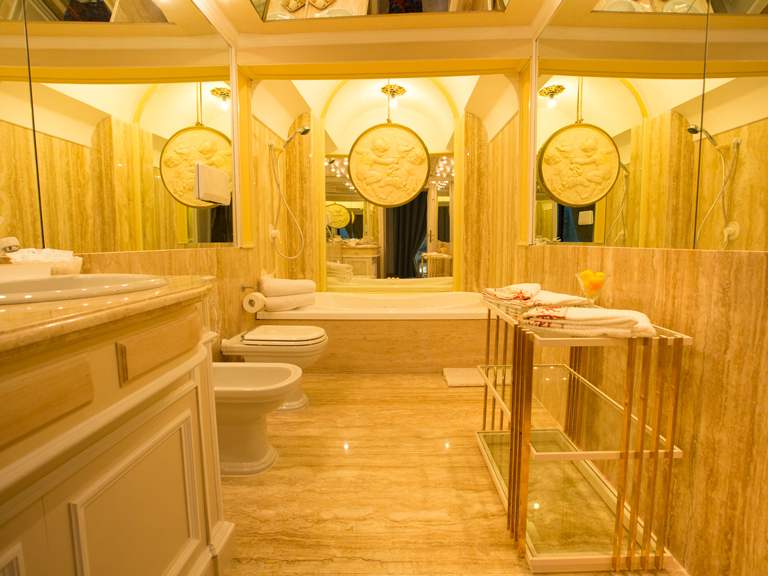 Many of the bathrooms have hydro massage bathtubs and on the floor below the comfortable sauna is always available for guests. 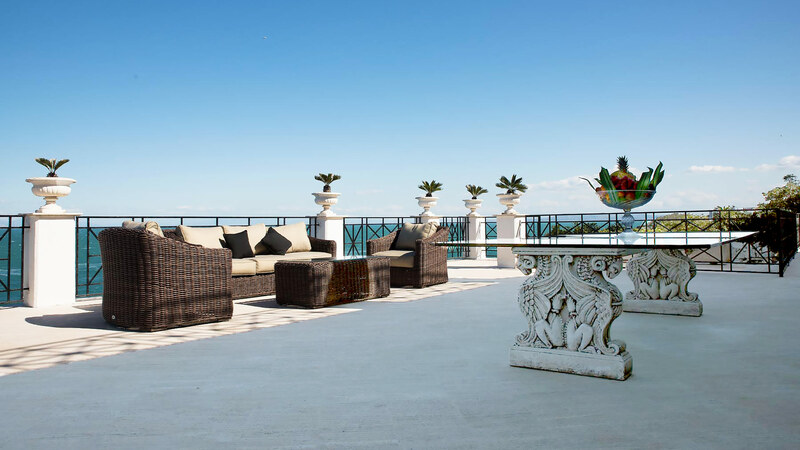 The rooftop terrace (access from the garden) boasts an amazing view of Ischia Capri, Ischia and Gulf of Naples. 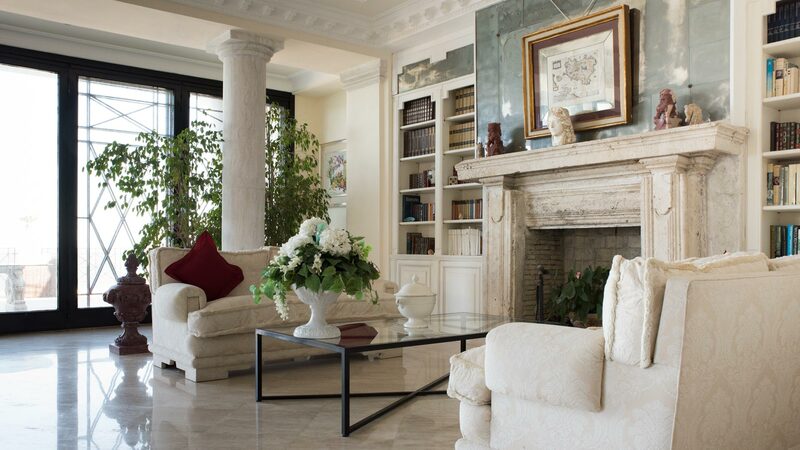 The décor and quality of the furniture is superb; detailed and carefully selected to the highest standards; as soon as you go through the entrance you will notice the quality of the architecture and of the furnishings, which consist entirely of antiques, alternating with modern accessories such as the sofas and comfortable chairs. 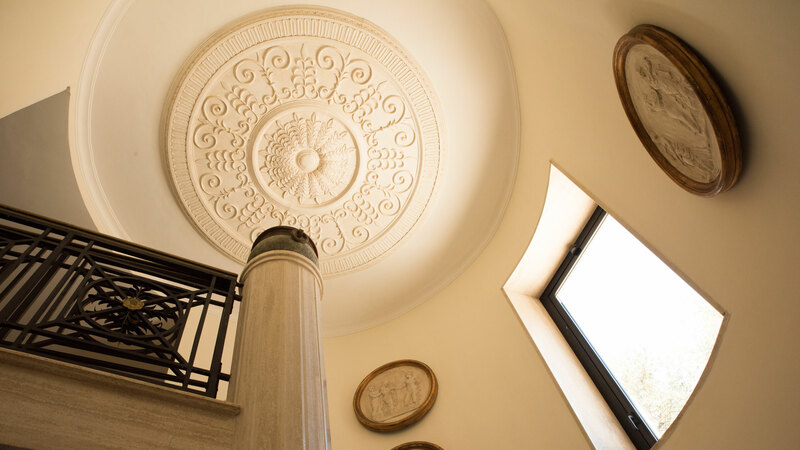 Every room has been decorated with valuable tapestries and large mirrors, and all of the living areas have been organized with taste and an eye for the practical. Immersed in a beautiful green garden, the ground floor of the property offers a hall, opening onto a majestic living area. 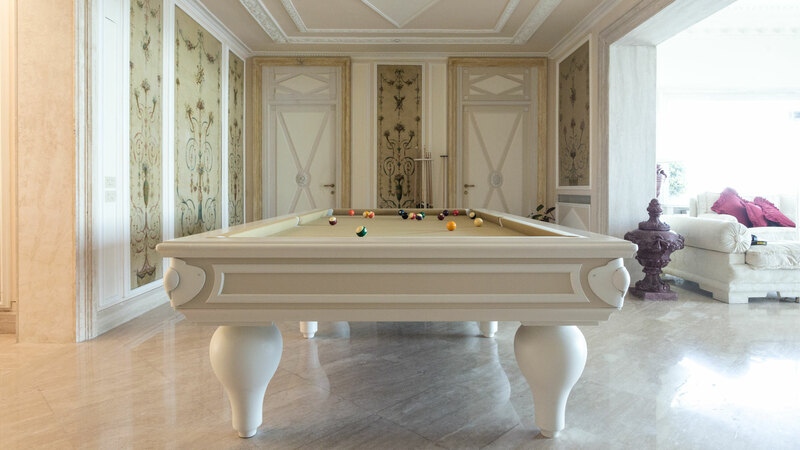 The space is cosy and welcoming and is furnished with two large sofas and a table, containing marble floors, a fireplace (for decorative purposes only) with antique ceramic tiles, flat screen SAT-TV and large, sliding glass doors opening onto the main terrace surrounding the house. Six bedrooms are located on the ground floor, bedrooms 7th and 8th are in a separate annex. 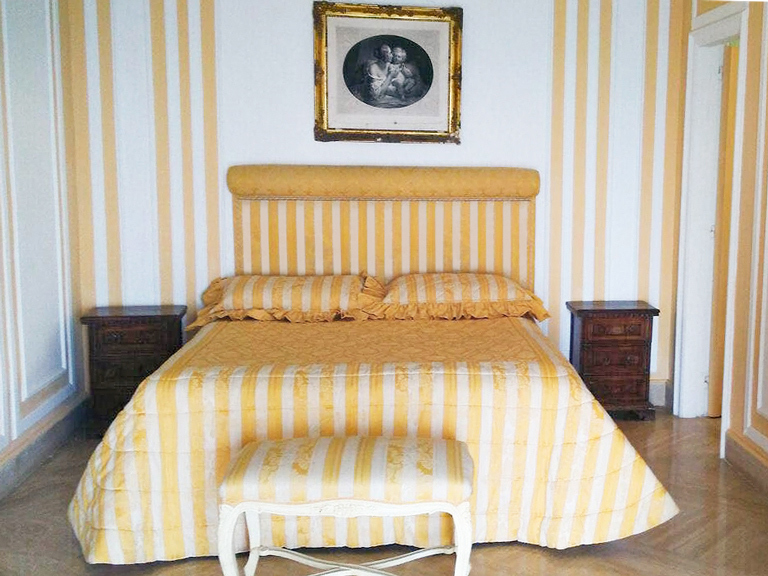 The villa possesses six and comfortable and warmly decorated, air-conditioned bedrooms. The master bedroom (n.1) access from the living area, has been furnished with king size bed, large dresser, telephone, TV and has a private En-suite bathroom and access to a small private terrace. 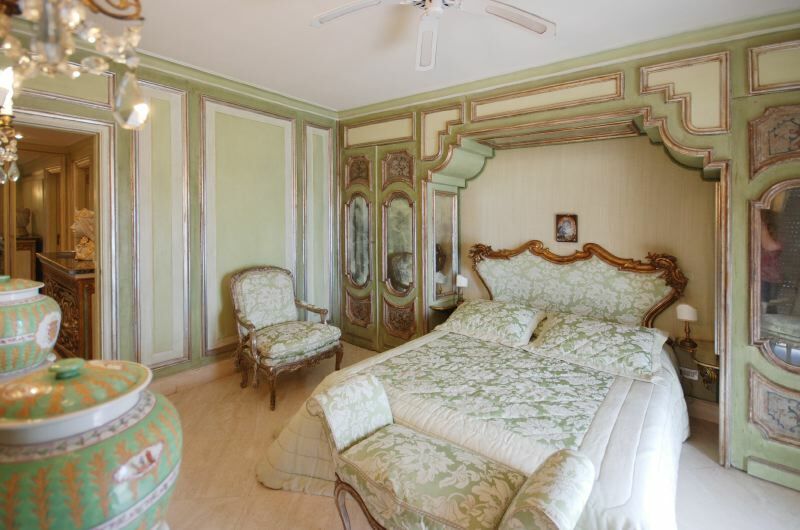 (Important notice: members of your party might need to walk through this bedroom to reach the second bedroom – they can avoid going through this room by entering from the garden). The second double bedroom has a large wardrobe, En-suite bathroom with shower (you will be able to enter the second bedroom from the garden, through an external access or passing from the master bedroom). The living room leads to a corridor where the other 5 bedrooms can be found. A pair of rooms, all with king size beds, all enjoy air conditioning, 4 with En-suite bathrooms, access to the main terrace. The lower floor, 25 steps down from the ground floor and the main entrance, consists of a spacious living-room with dining area leading to the swimming pool zone with various locations for relaxing, gazebos, sauna, outdoor wood-burning stove and beautiful sea panorama, an equipped kitchen; while a bath and sauna room are located along a corridor. The kitchen can be accessed from both the dining area or the garden. It is fully equipped with refrigerator/freezer, ten-ring gas stove, dishwasher, pots and pans, plates and silverware, American/Italian coffee maker, ice maker, Espresso coffee maker, toaster, blender and microwave. 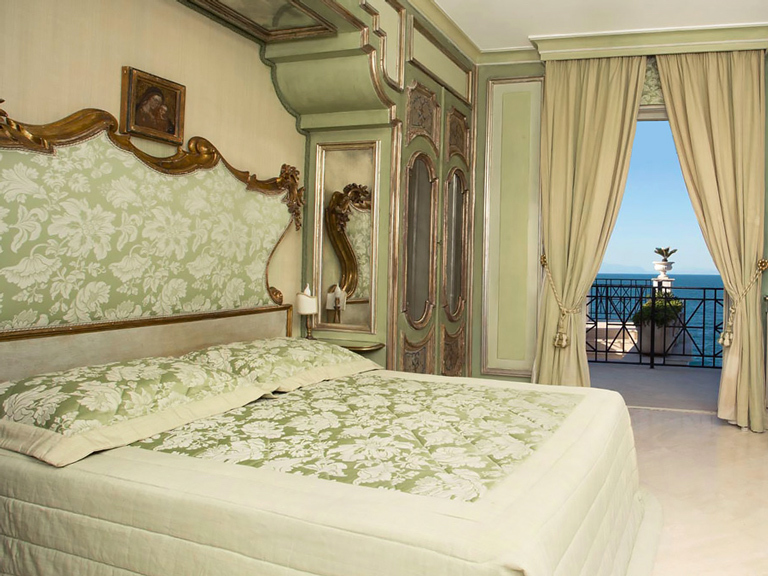 Bedroom 7: (located along the walkway that leads from the swimming pool to the slope down to the sea), 35 sq. 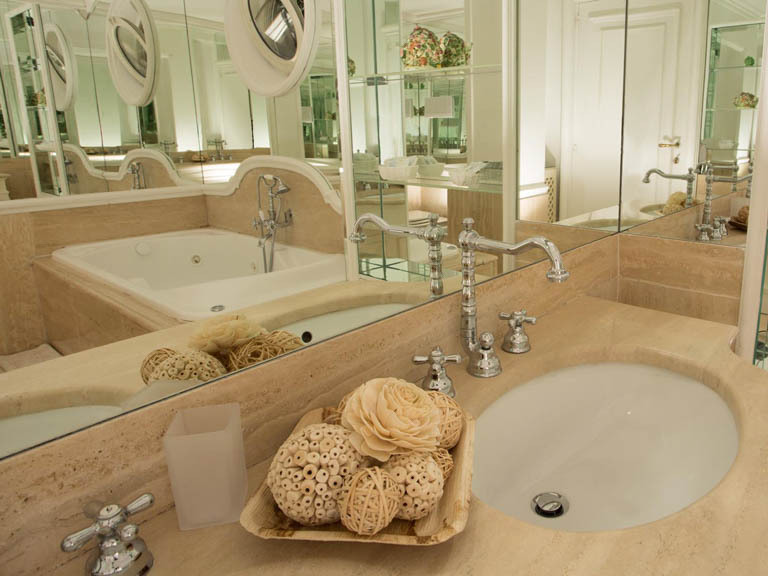 m. The furnishings include a King size bed, with En-suite bathroom whirlpool bathtub, TV, Air conditioning. 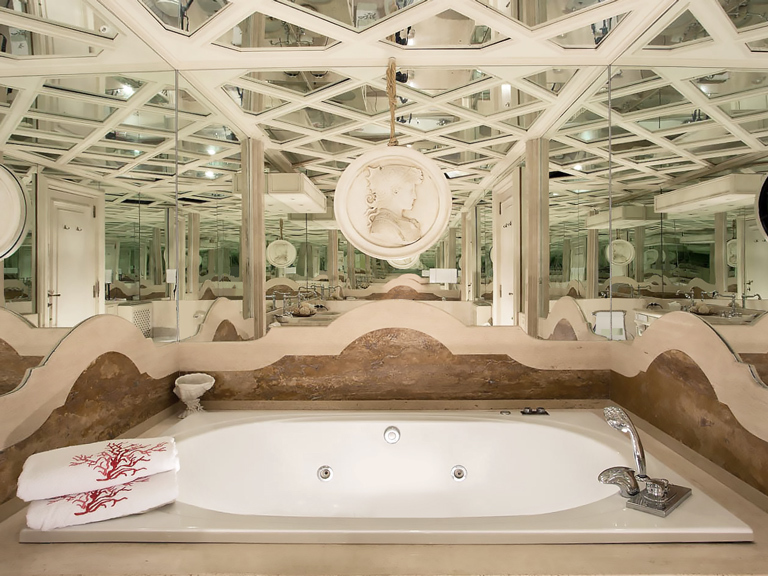 You will be able to enter the seventh bedroom only from the pool-terrace. The large private terrace located on the lower floor also contain a swimming-pool filled with sea-water and there are several areas furnished for relaxing or dining outside with various locations for relaxing, gazebos, sauna, outdoor wood-burning stove and beautiful sea panorama, along with a descent down to the sea itself via a convenient flight of steps. 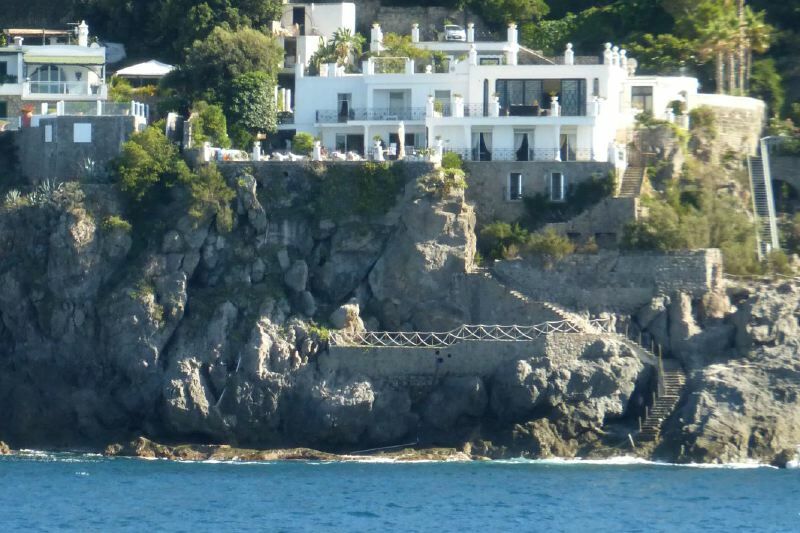 Located at the beginning of the slope down to the sea, the last suite built and one of the most impressive, because it is dug directly into the rock of the coast. This room offers an exclusive view, has been furnished with a King size bed 180×200 cm., Air conditioning, En-suite bathroom with shower, Juliet balcony. (Important notice: Dependence n. 8 (built in the rocks) available only on request, in advance and if confirmed by the owner). 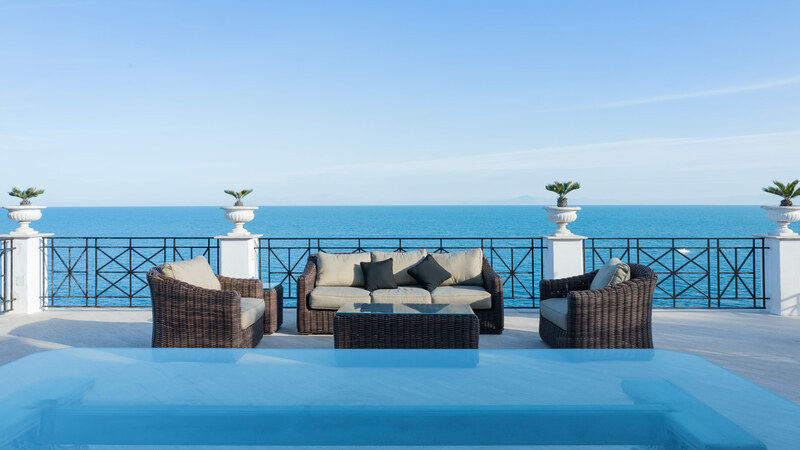 From the pool terrace you will have a direct access to the sea through a concrete platform, you will reach it going down a walkway that cuts through the terrace and includes approximately 100 stairway steps (water shoes recommended!). 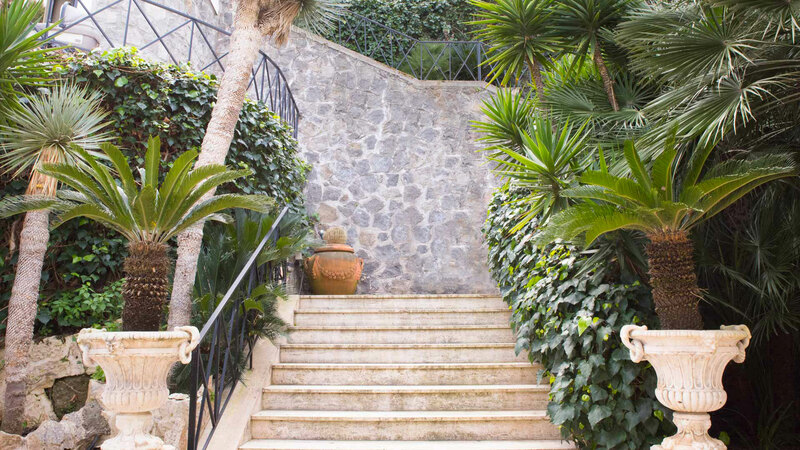 You will reach Villa La Scogliera from the parking area going down an external stairway which consists of approximately 50 steps. Parking: you will be able to park it on the premises, free of charge inside the entrance gate. The parking space is suitable for just 2 cars (small-size). Note: From the main street level and gate of the villa a small private road downhill leads to the parking area (is about 200 meters) and is not accessible by large vehicles / SUV, minivans as the road is very narrow. Laundry room: You will be able to reach the laundry room from the garden. Here you will find a washing machine, an iron and an ironing board at your disposal. Porter service from villa parking to villa entrance (note: from the parking area going down an external stairway, which consists of approximately 50 steps). € 5.000 to be paid on site (cash only) or by bank transfer 2 weeks before the check-in date.